Monday 8th May Bishop Auckland to Yarm . Got up around 7am Colin was up already in the loft looking for his snorkel. Hell had he heard a bad forecast. No he was getting ready for his week in Greece. Coffee and cereals and then we loaded up proper with panniers for the journey south first via Brockwell court Coundon grange for the breakfast to beat all breakfasts. Yes our mother had done the breakfast to beat all breakfasts..
Eggs bacon, sausage, fried bread, beans etc. Every cereal possible, toast, Orange juice..
1030am we loaded back up, and set off Shildon bank not a problem even had time to drop back down when I missed a gear and cycled up it twice, well part of the way? Along the back's down to Redworth and right into the country lanes.. overcast but warm it was nice to start heading south. 1130am Walworth we called in for a coffee at Jane's Mum and Dads and around 12noon set off for our next stop The George hotel at Piercbridge sat by the River bank and experienced our first bad pint which was cloudy and had to go back .Greame said it was because we were in Yorkshire..
We cycled up to Mandied Colin didn't know I knew where the pub was and we bulled him for not doing the research and checking the pub opening times. When he reccied the route. 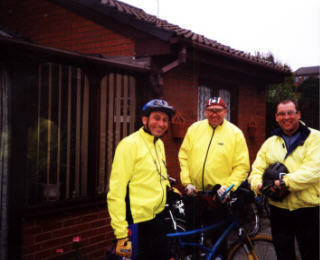 We cycled through the lanes following the tees valley , pretty countryside it was interesting cycling along lanes that I had driven many times. As we cycled the sun came out. Sun and cycling this wasn*t true. 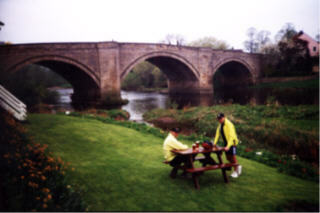 As we got to Croft we cycled over the bridge back into Co Durham and a pint at the Comet. We sat outside in the sun. again. 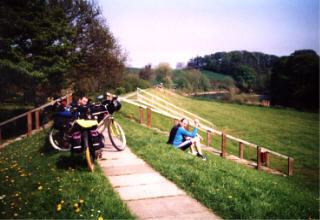 We cycled steadily down to Neasham and sat by the River and ate our sandwiches. Kindly prepared by our Mother, It was pleasant sitting in the Sun watching the world go by,. Middleton One Row. Where we met Mr Rent - a - Mouth. We stopped at the Davenport. What with the tables just been painted and then this guy with his mates jumping into our seats. Why did we stop. Anyway listened to him prattling on while we sipped our pints. Then the question came what were we doing. Then the challenge came He said you cant have a drink in every pub up down Arm high Street. So we threw the gauntlet down for 6 30 pm.. That night. We had our first mishap Colin lost his coat and had to cycle back for it. Hell when we got to Yarm we counted there was only 7 pubs. We cycled into Yarm and found the Digs which were a good walk out of the town. Anyway we strolled in for a meal and a couple of beers. We were going to get a taxi back but, certain prejudices made us have to walk back. It was funny that day Me and my Bandana I said I looked like Hulk Hogan, more like Bulk Hogan someone said. 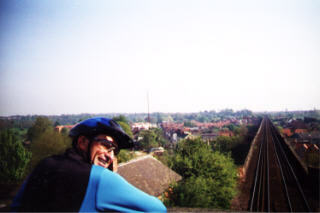 All day long Colin had been on about this bank over the railway at Aislaby. No problem we sailed up. It was a good ride on quiet roads in the Sunshine, a nice steady day. Frightening thought we had followed Colins routes for two whole days! Time for Mr map to take over.